I am officially an ardent fan of Ardent! Currently, there are11 items on the menu and, for now, they told me the menu will remain the same for at least a few months. I really cannot even begin to describe the food and do it justice. It is simple and complex at the same time. For example, they offer something called Milk. It is a piece of bread, butter and cheese. Sounds boring right? It’s not. It’s divine. They go to a farm outside of Madison once a week to buy the milk and the cheese. Then they make their butter with the milk and use that butter in the bread. The French onion soup is like no other. It’s kind of like a deconstructed French onion soup that they make in front of you. They dehydrate cipollini onions and bring them to life beef consommé and of course add in some aged parmesan. Oh and by the way, the beef stock is made from the cow that the chef/owner gets from his Dad. This new restaurant is simply fantastic. Sure there are some things I liked more than others. For example, I now know I am not too keen on bone marrow on my beef tartar. But overall the food is highly imaginative and meticulously prepared. The space itself is small. Reservations are a must on weekends. And I firmly believe once this place catches on, it will become impossible to walk in and sit at the bar during the week. One word. WOW. Ordered delivery from Carson’s last night. While our sampling of their menu was limited, everything was simply superb. I was skeptical of the hyperbole they use to name their menu items, But, the caesar salad lived up to “legendary”. I can see what their au gratin potatoes are “famous”. And the while they don’t embellish the name of their barbecue back back ribs, they could label them “divine”. This laid back bar and restaurant in Bayview has never really been high on my list for great food but I heard they had a new menu so we checked it out. Plus, it bills itself as specializing in southern fare which is right up C.’s alley. However, because I am not able to tolerate peppers or peppery spices, I am writing this post through the taste buds of C. Everything from the cast iron fried chicken to the deviled eggs was infused with peppery spices of some form. So I ate the biscuits and C. ate everything I ordered plus crab soup and smoked pork shoulder. He raved about everything he sampled and give it a big thumbs up. And let’s not forget the grits. C. is a grits connoisseur. He believes no restaurant in this state has a clue how to make grits. Until now. He said they were fantastic. So for those of you who don’t mind spicy, and love southern food, then check it out! Cute little deli just opened up in the Third Ward. They have a nice selection of sandwich specials or you can build you own. The one I had was ok, it was a little heavy on the bread for my taste, but a few of my co-workers have said really good things about their selections. And I might add, for me, it was big enough for two lunches! But, there are a couple things I love about it. First of all, it is also a teency little Italian grocery store. I will definitely be going back to grab some of the Italian goodies they stock. They even sell wine! Secondly, and what I consider the best part, they are opening a little speakeasy in the back room in about a week. There is sort of a secret entrance from the back alley or you can enter through the restaurant in which case it will look like you’re walking in to a hotel according to the man I talked to. Cannot wait to check it out! I have checked out the new Prodigal Gastropub twice. It is a fantastic space in the old MOCT nightclub space on Pittsburgh. The interior design is open and airy and both times I was there the giant garage doors on the front were open so it was almost like al fresco seating. They did a lot of work to change it from the modern nightclub to a more relaxed and rustic décor, and it turned out nicely. They pitch themselves as “contemporary American eclectic” food, although C. commented and said it was like high end bar food. Hence gastro pub, I guess. Regardless I love their kind of menu where you can chooses from a variety of things you simply can’t find other places. Their chef comes from Bacchus so you know it is imaginative, and well done. As for the food, they have quite a few small plates. We had the fried chicken lollipops and grilled duck confit flatbread and they were both quite tasty. On the entrée side of things there is a range from fish to beef to chicken to pork to pasta and more. And from what I can tell from their Facebook page, they also prepare quite a few weekly specials so it is not always the same. As for drinks, they place an emphasis on their bourbon – supposedly they have over 40 options – and have a room in the back called the “Bourbon Room” with a cozy little fireplace and seating areas. Craft beers and craft cocktails also seem to be high on their list. The craft cocktails are quite interesting, I am sure because the bar manager came from the Hamilton. I stuck with my usual wine and I thought they had a nice selection to choose from. I will admit the first time I went we went with a group of 6 and our food took forever and was cold. Growing pains I think, I did go the first week they opened. Upon my return however they appeared to have worked out the kinks and I fully intend to go back often to sample more options. One warning. Your knife and fork WILL slide right off the plates they use, so watch out. Our family has a long-standing tradition of going to the opening day of the Wisconsin State Fair. We look forward to it all year. We plan for it. We arrive when the gates open at 8:00 and leave at 9:30 at night. We go to eat. And we’re unapologetic about 12+ hours of eating. The beauty of the food at the fair cannot be topped. Fried. On a stick. Delicious. Innovative. Just a few words that describe the food. The fair has something for everyone. 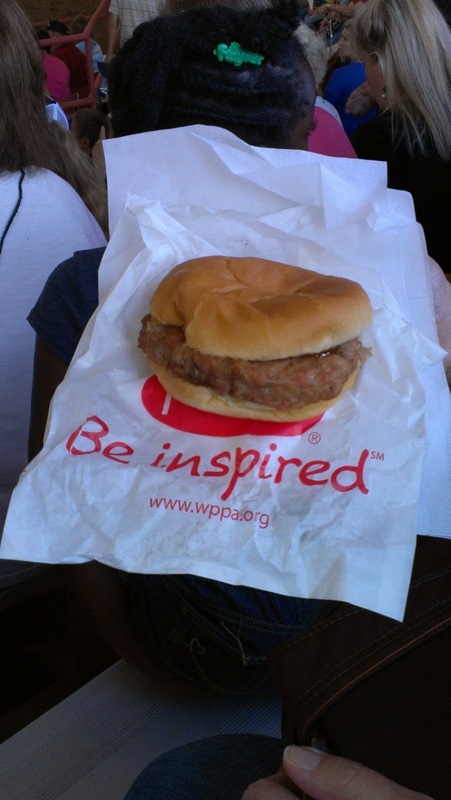 Below are the highlights from a Fair Foodie Family’s first day 2013. We have years of experience uncovering our favorite foods, and we think we’ve uncovered the best. But there are more foods than anyone can ever truly uncover. Please use our list as a helpful guide to structure your visit, especially if your time is limited. But please, please go with an open mind that is ready to experiment. Go off the beaten path. Be crazy. Truly, the world is your eating oyster at Wisconsin State Fair. We hate to play favorites with our State Fair delights. But in our eyes, one dish, more than any other dish, left us lusting for more: Deep-fried peanut butter and bacon nuggets with Berry Weiss Jelly. 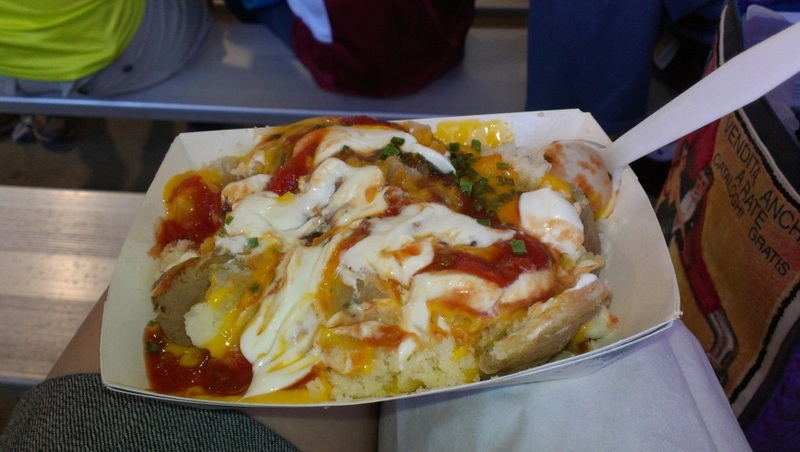 We heard about Saz’s newest offering, a finalist for a coveted State Fair “Sporkie” award. That title gave us little consolation because we remembered that the Machine Shed’s deep-fried butter was recognized a few years back, and those didn’t go down so well. Anyway, we ordered and were quickly presented five walnut-size chunks of deep-fried loveliness, all nice and tan, looking kind of like chicken nuggets. We weren’t sure what happens when you bite into these things, so we figured the best approach is to sit down at a table, rather than eat ‘em on the run. Ok, here was the biggest issue we faced, beyond our usual fears of the unknown. What could possibly win out in a ferocious flavor battle with bacon? Peanut butter? No way. We love bacon, don’t get us wrong. But bacon is the sledge hammer of flavors. Bacon could probably beat back a Dodge Charger in a one-on-one. Bacon pretty much destroyed chocolate when Machine Shed paired the two on a stick. Peanut butter? No way. Guess what? Way. Peanut butter wins. Just a hint of smoky bacon and a serious blast of peanut butter in the center. All wrapped in a really tasty, crunchy panko crust. Yes, peanut butter rules! It was so good. Seriously good. Perfect texture. No grease. No leaking contents. A nice, gooey amalgam of buttery-smooth peanut butter and what appeared to be liquefied bacon, with peanut butter clearly leading the way. Way to go peanut butter! And the side of Berry Weiss jelly for dipping was flavorful and light, the perfect complement. No grease in the basket. Nothing on the fingers. Don’t even need a napkin. Perfect for walking. State Fair perfection. Well done, Saz’s! Having hit a home run with the peanut butter bacon bites, we tried our luck with another Sporkies finalist: Thanksgiving Waffles. Slim McGinn’s interpretation of the favorite southern dish Chicken and Waffles is simply delightful. Thanksgiving in August? Yes, please! Stuffing mixed with craisins and waffle batter form the waffle base. Crisp on the outside and chewy on the inside, this waffle had to have been freshly made. 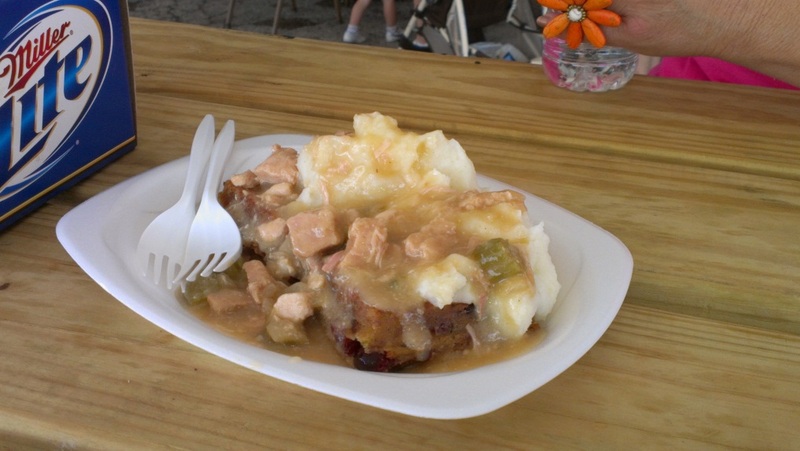 Layered on top was a healthy scoop of creamy mashed potatoes, turkey gravy and chunks of turkey. Each delectable layer is perfectly proportioned so that you get a taste of each in every bite. This dish could run of the risk of becoming a soggy mess, but Slim McGinn’s nailed it. Everything you love about Thanksgiving in a fun, new form, and not on a stick! We definitely recommend grabbing a table to eat this one. Please also note that this dish could be a real sinker if conquered alone. 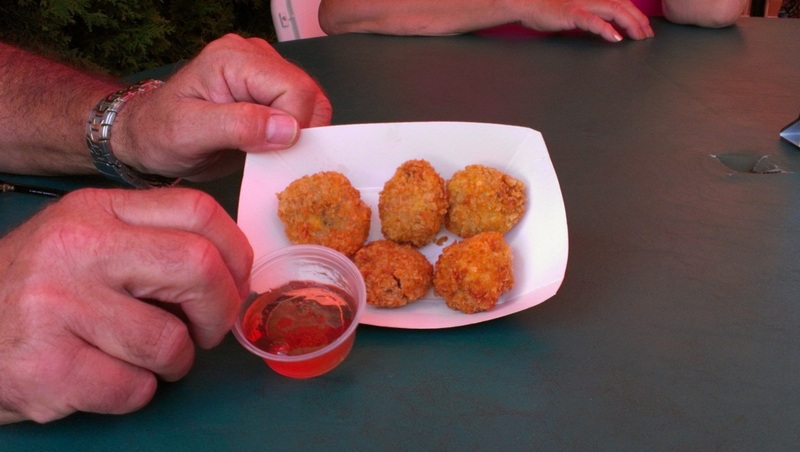 There are so many tasty eats to try at the fair, so consume this one responsibly. Split it! Other main meals to check out are the Pork Burger and Pork Chop sandwich from the Pork Schoppe and the Rib Eye Steak Sandwich from the Cattlemen’s Beef Association. These are a bit of a family tradition and no trip is complete without them. You can’t go wrong with these quality meats from Wisconsin. An added bonus is they’re also good walking foods. But if you do need to take a break from pounding the pavement, both of these booths are located right outside the coliseum. We usually grab a sandwich and catch a round or two of horse and cow judging. One last main dish worth noting. For dinner, we bellied up to a table at Tropics at the Fair. Tropics has grown to be a new family favorite over the past couple years. The ambiance can’t be beat. Live reggae music, sand under your feet, tropical drinks and Cajun delights. We relaxed with a couple Bahama Mamas and Cajun barbecued peel-and-eat shrimp. In our humble opinion, grilled shrimp can’t be beat! The Cajun spice gives them a great flavor but without being overly spicy. Our family has some non-spicy eaters, but even they loved these shrimp! No trip to the State Fair is complete without these favorites. They are Wisconsin products that embody everything that the Wisconsin State Fair stands for. You can make all of these foods at home, but you could never come close to the flavors achieved at the fair. Something magical happens at the fair. First and foremost, do not leave the fair without a grilled corn on the cob from the New Berlin Lions Club. We don’t know if it’s their corn, their grills or the buttery goodness that the corn takes a swim in, but these puppies are a bite of heaven. You will be covered in butter when you’re done, and you will be picking corn out of your teeth the rest of the day, but that’s just a small price to pay for this buttery yumminess. The Baked Potatoes from the Wisconsin Potato Growers are simply to die for. Whereas you can see the corn being prepared, you cannot see the potatoes baking. Are they simply made with love? Or are those potato growers injecting them with secret, magical flavors? We’ll never know what goes on behind the scenes, but these potatoes are THE best baked potatoes you will ever eat. And you can customize the toppings to your liking: butter, cheese, salsa, chili, sour cream and new this year – bacon. The line always looks long and intimidating. But it moves fast and it is every bit worth the wait. 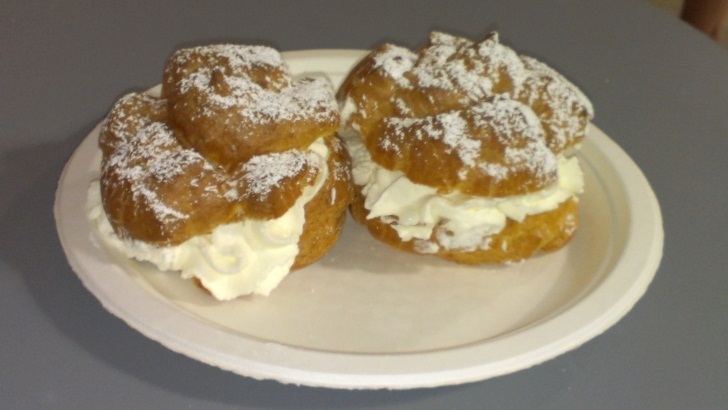 And last, but definitely not least…the Cream Puff! Nothing says Wisconsin State Fair more than the cream puff. This airy pastry is filled with the most heavenly cloud of cream and dusted with powdered sugar. While the recipe for this cherished dessert remains unchanged, we think there is a noteworthy difference this year. Historically, the cream has always been made using Gold Guernsey Dairy’s cream. 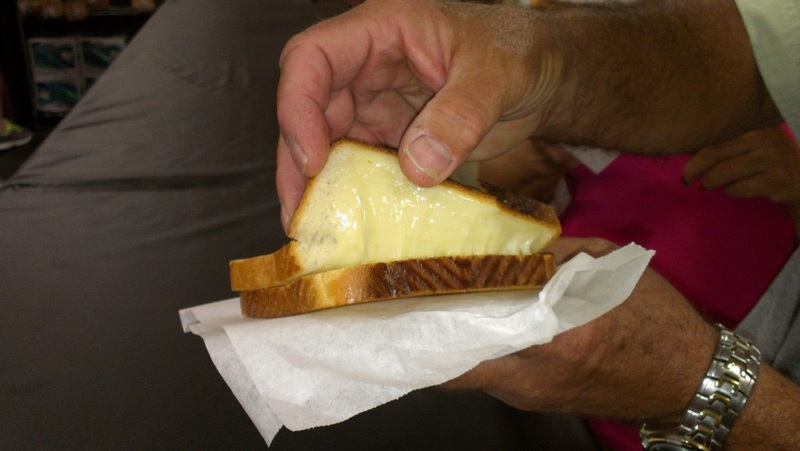 The sudden closure of Golden Guernsey Dairy left State fair searching for a replacement. We don’t know who is supplying the cream this year, but what we do know is that the cream is creamier than year’s past and full of texture. Do yourself a favor. Save room for a cream puff. Better yet, get one right away before you have the chance to get full. Go to the Products Pavilion. Go directly to the Products Pavilion when you arrive. Pass the chocolate-covered bananas, pork doughnuts or whatever else that gets in your way (you can always get those later). There, at the Products Pavilion, you will find the absolute best, hands-down, number-one food deal at the fair. Three, count ‘em, three grilled cheese sandwiches for just five bucks. Choose real Wisconsin cheddar cheese or swiss. Either way, they’re simply terrific. A great bargain, and it lays down a good, solid base, for whatever you wish to consume, solid or liquid, over the next hour or two. And if you really want to extend the deal, quickly take those sandwiches down to Herb Kohl’s milk booth and wash ‘em down with a 25 cent milk, in chocolate, root beer, cherry vanilla, raspberry and banana. We suggest the root beer or cherry vanilla milk. This is deal making of the highest order. So you’ll have some extra money in your pocket to buy perhaps an extra ShamWow at the Expo Building! We finally checked out this cute little breakfast and lunch spot on Farwell. It touts a commitment to using locally grown seasonal ingredients, as much as possible, and creating familiar foods with inventive twists. I’d have to say they deliver on that promise. For example, I had the mushroom omelet with shiitake, oyster and button mushrooms, shallots, fresh thyme and Gruyère cheese, and it was superb. C. had the “Simple” benedict with herbed polenta w/chicken sausage, poached eggs, asparagus w/Creole hollandaise. Spicy, but very good. Next time I think I will try the oat pancakes topped w/fresh bananas, candied walnuts and rosemary & orange whipped cream or perhaps the Maple Glazed Pork Belly Bird In A Nest with Brioche, eggs, maple glazed pork belly and caramelized onions. As you can see, it really is quite an inventive menu. And the space itself is a delight. Very open and airy and colorful. Great little place to check out for breakfast or lunch. However, don’t expect to have a mimosa on your Sunday morning brunch, they don’t have a liquor license. Oh happy day. We have another new restaurant in Walker’s Point. Blue Jacket just opened in a completely renovated building next to La Merenda. They have themed it around a celebration of the Great Lakes inspired by their love of sailing. The waitress told us “the drink menu is inspired by 300 years of maritime tradition”. The renovation certainly was a success. The space is clean and contemporary with seating inside at the bar, high tops and booths and seating outside as well. And it is airy and open which is accentuated with a giant garage door that opens up when the weather is nice. And as for the music, well it comes from a turntable. How nice to listen to vinyl records for a change! I am sure not I “get” the Great Lakes theme on the food short of some local water fish options, but who cares. The menu was right up my alley. It is not an extensive menu, but we still had a hard time picking because everything looked good. They have a few small snacks, “planks” which offer an artisan meats or cheeses, then plates which varied between appetizer sized offerings and full dinners. We started with the white cheddar and black truffle popcorn while we perused the menu. It is addicting. Then we sampled the fried Clock Shadow Creamery cheese curds with a horseradish sauce. I was pleased to see that they were light and puffy and not heavy handed on the fried aspect like so many cheese curds can be. C. had the whitefish with brussels sprouts and guanciale which was quite good but you need to like a bit of a fishier fish. And I had one of the best meals I have had in quite a while, the duck and mushroom meatballs with a poached duck egg and asparagus on a creamy polenta. WOW! It was amazing. As for the cocktails, there are plenty to choose from. They had some guidance from the folks at Bitterbube on the cocktail menu and it is quite interesting. But the real surprise was the entire page, three columns wide, of various spirits, including about 30+ options for rum. As of this writing they had not developed their dessert menu yet so more to come on that aspect when we go back. Which we will. Because it is a new little gem which will be in the regular rotation for us. I could not go to Paris and not l share some of the places we ate at for future reference. Frenchie – at the time of this writing, the restaurant was a tough reservation to get. But I did it two months out and it paid off. It is a tiny little place with a tiny little menu. Only three courses. C. said we had more options to pick from on the plane. But letting the chef make what he feels like every night is well worth it. The food was superb. Be sure to pay a visit to their little wine bar across the street. La Fontaine de Mars. My friend E. who lives in New York told me to go here because she and her husband thought it was so good they ate their twice. And when our friends from London invited us to dinner, guess where they picked. FDM. Like E. we too went back for a second evening. It was a classic French bistro fare but with amazing nightly specials. Dishes like foie gras wrapped in bacon and chicken with a morel mushroom crème sauce and sponge cake where they bring you a bottle of cognac so you can drizzle how much you want over it. Superb. Semilla – little neighborhood restaurant in St. Germaine de Pres. Delightful. Went on a Monday early at 7 PM. By the time 8:30 rolled around, it was packed. And it was not tourists. Locals. But the servers were delightful and helped us figure out the menu. We thought “osso bucco” would be veal. Wrong. It was called that because of the way the bone in the monkfish looks. It tasted like lobster. Divine. And veal tarte was not like carpaccio. It was little chunks of veal in an amazing lemon caper sauce. Les Ombres. I had pigeon. Well, it was really squab but that is how it read on the menu. With a mashed potato and black panko bread crumb crust. Let me just say it sounds better when they call it Filet de pigeon snacké, assaisonné citron/muscade, parmentier de cuisse, chapelure noire. I told C. that I put it on my top 20 list of best dishes that I have ever had. And the view is incredible overlooking the Eiffel Tower, especially when they put on the light show at 10 :00. Big Daddy’s Brew and Cue is a new barbecue joint next to the IPic at Bayshore. Yes, it is a mall restaurant, but if you’re in the mood for some really tasty smoked meats like pulled pork, beef brisket, beef tenderloin, house-made hot links, and, of course, ribs, then I’d definitely give it a go. The ribs were outstanding and you have options for the sauce: a sweeter one with a Sprecher root beer base, a Carolina Gold which is mustard and vinegar based and Kansas City which is the spicy option. Speaking of spicy, the chili is HOT. C. gave it a huge thumbs up. It had pulled pork in it. But he said it was a pretty intense heat. Main dishes come with 2 sides and cornbread. It’s all very nicely done where things like baked beans and mac and cheese come in small cast iron skillets. But honestly, save your room for the meaty goodness. The sides were “ok” but not great. They’re big on beer (obviously, hence “Brew” in the name) and specialty drinks. Oddly enough I could not find a drink special that tripped my trigger, but if you like things like Lemon Drops, Brandy Sours, Bourbon Sours, Gin Gimlets and things of that nature, then you will like their cocktails. From an atmosphere perspective it a little bit sports bar/barbecue joint. It’s fine. And there is some eye candy for the men, since the waitresses all wear super short cut-off blue jean shorts and plaid sleeveless shirts and cowboy boots. C. dubbed them “naughty cowgirl outfits”. We will go back again next time we see a movie. And I will have only the ribs, no sides, and instead of a half rack, maybe a whole order!